WHILE A MICROBREW was once something likely to be cooked up in a friend’s shed, craft beers are now so mainstream you can expect to stumble across a decent IPA next to the cans of lager in your average Tesco. And local cider makers are hoping to ride the same wave of popularity that have made craft beers a multibillion-euro industry worldwide. Chris Hill, one of the founders of Orpens Irish Cider, said the craft-beer trade had set a good template for craft-cider makers in developing an appreciation for specialist brews among drinkers. “The craft industry, in pretty much every English-speaking country, is booming,” he told TheJournal.ie. In Ireland, where farmhouse cider making has been widespread since at least the 1600s, numerous boutique ciders like Cockagee and Craigies ciders have been building on that tradition and winning praise for their craft brews. Hill said Orpens, which only started supplying commercial-level products a year ago, had distribution with all the major supermarket chains in Ireland and they were looking to the UK for bigger opportunities. Last year total UK cider sales were put at about £3 billion (€4.2 billion at today’s rates) and growing, compared to a longer-term decline in beer consumption. “Premium” ciders showed the strongest growth – up over 25% in just a year. The only beers to buck generally flat or falling demand in the biggest markets have been craft brews and last year the Irish craft industry predicted their output would grow 45%. Overseas, where craft breweries have been a part of the mix for longer, the growth in craft beer sales has been even more staggering. Researchers Mintel estimated turnover for the industry in the US would hit $20 billion last year – more than double five years ago. Hill said he and business partner Matthew Tindal both had years of experience in the wine industry before turning their hands to craft cider when they identified a gap in demand that the big brewers weren’t tapping. In 2013 the pair went through the joint Bord Bia, Enterprise Ireland and Teagasc-run Food Works programme for food-and-drink startups which Hill described as a “practical MBA” for developing their brand. All of the big producers have done a really good job in bringing the cider category to life, but they’re really catering for a younger customer,” Hill said. 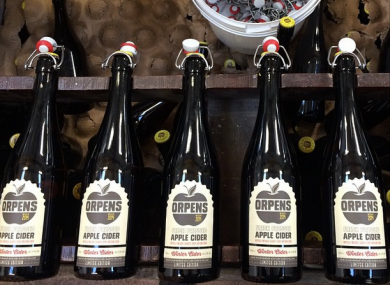 Orpens was made from fresh-pressed apples and had less sugar than most mass-produced ciders for a “more sophisticated palate”, he said. Bulmers dominates the Irish cider market with about four-fifths of all sales and Orpens is produced in the same Clonmel factory of the big brand’s parent company, the C&C Group, although they used very different approaches. “That has been a bit of an issue with the other craft producers because they see us dancing with the devil,” Hill said. He said they were looking to triple the business’s turnover this year and continue the growth into 2015, and there were some big deals in the pipeline for the UK. It’s growing a bit faster than we expected, but that’s a problem we don’t mind having,” he said. Email “Why craft cider could be the new craft beer”. Feedback on “Why craft cider could be the new craft beer”.